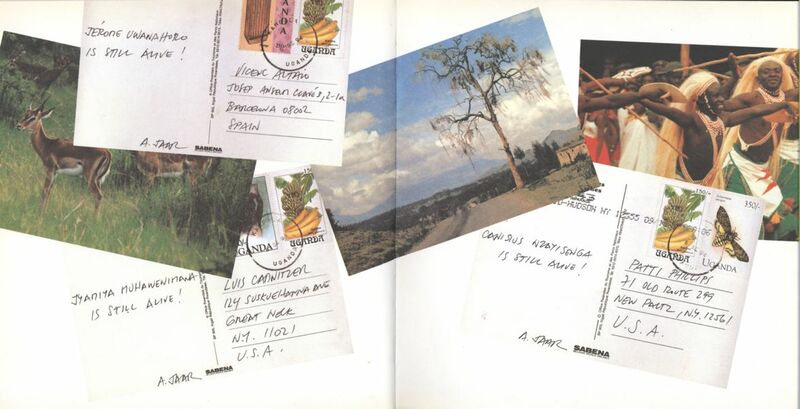 One day, Jaar came upon an inoperative post office and bought up the last of their postcards. 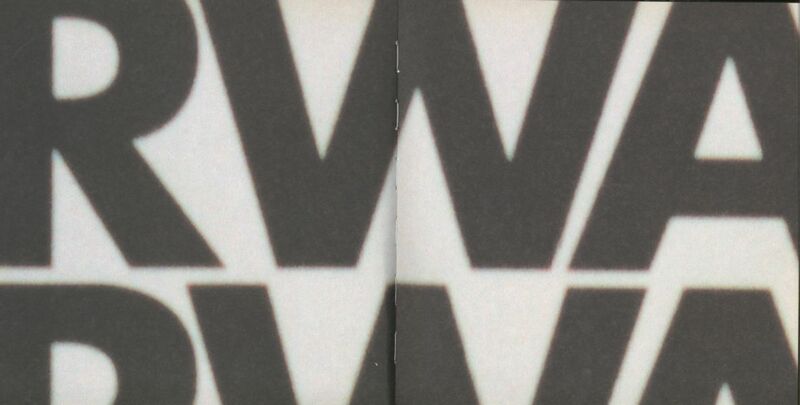 The cards, which had been produced at some point bv the Rwandan Office of Tourism (and sponsored by the Belgian airline Sabena), all had the same slogan emblazoned across the top: "Rwanda— Decouvrez 1000 merveilles, au pays des 1000 collines" (Rwanda—Discover 1000 marvels in the land of 1000 hills). On the reverse they carried tourist pictures of the wildlife in Akagera National Park—impalas, zebras, eagles, and lions—and beautiful mountain vistas of Kibuye and Gisenyi or the serene skies over Lake Kivu. In November of 1994 Jaar was invited to participate in a public art project in Maimo, Sweden. e was given the use of fifty light-boxes all around the city in which to display any image he wished. But he did not wish to display an image, yet. The truth is, he could not. 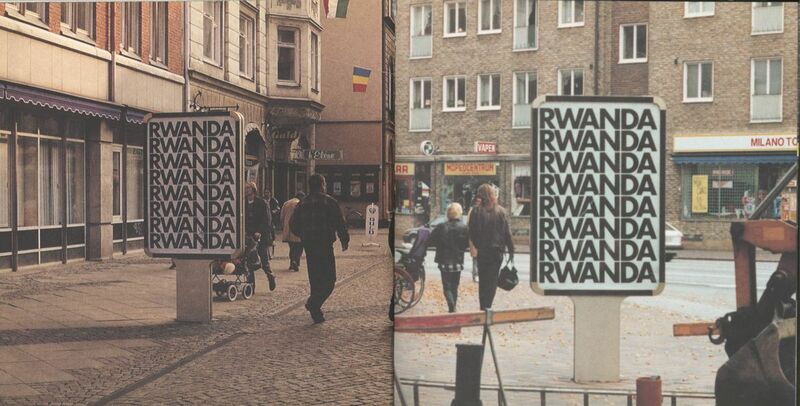 Instead, he filled the light-boxes with Rwanda; that is, with the name "Rwanda," repeated over and over, filling up the frame. If all of the images of slaughter and piled corpses, and all of the reportage did so little, perhaps a simple sign, in the form of an insistent cry, would get their attention. 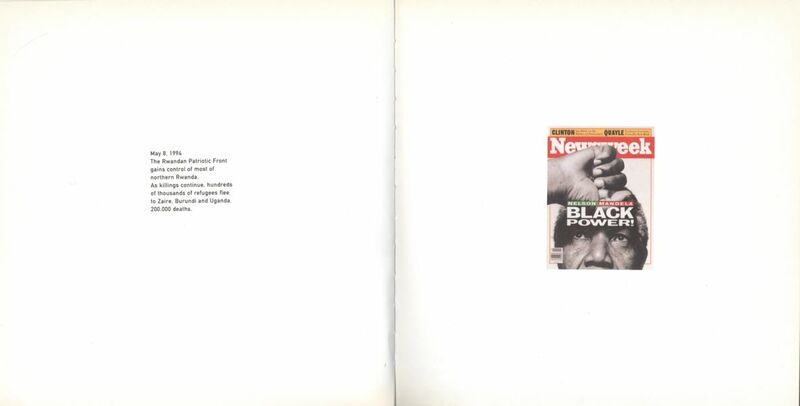 Real Pictures was first exhibited at the Museum of Contemporary Photography in Chicago in January 1995. 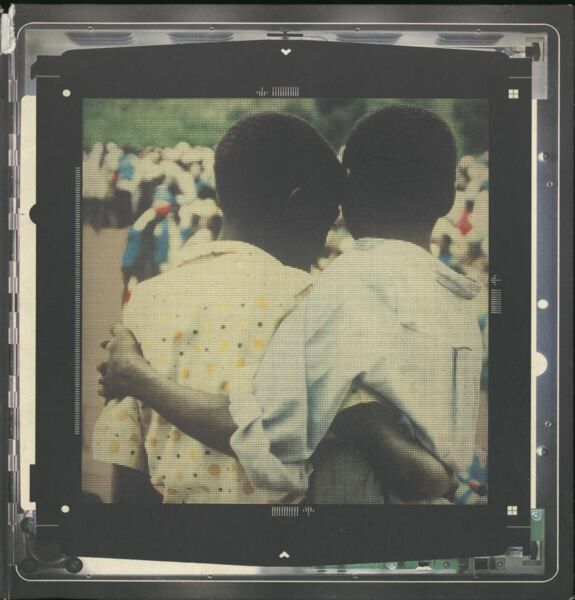 Out of the thousands of photographs he had made in Rwanda, Jaar carefully selected sixty images, to show the different aspects of the genocide: the massacres, the refugee camps, the destruction of cities. 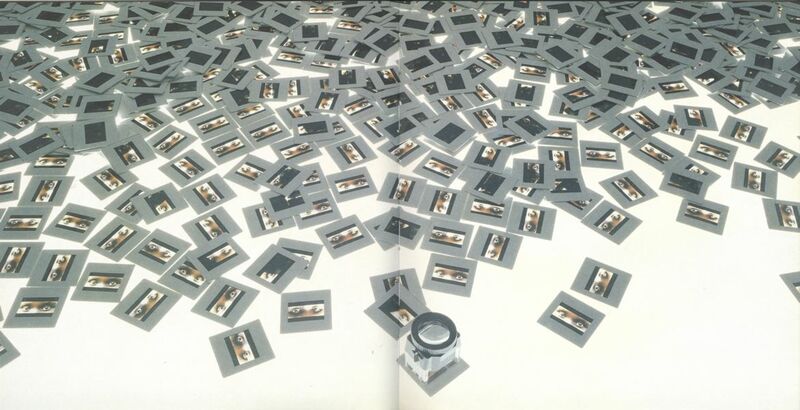 He then "buried" each of these images in a black linen box. 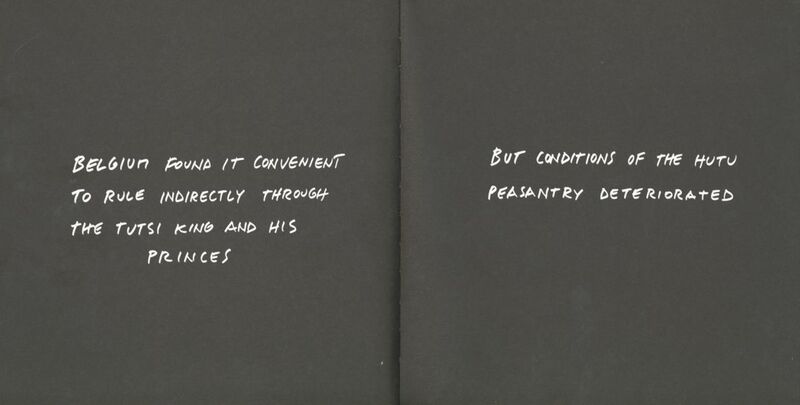 On the top of each box, he had silkscreened in white a written description of the image inside. May 8, 1994 The Rwandan Patriotic Front gains control of most of northern Rwanda. As killings continue, hundreds of thousands of refugees flee to Zaire. Burundi and Uganda. 200.000 deaths. 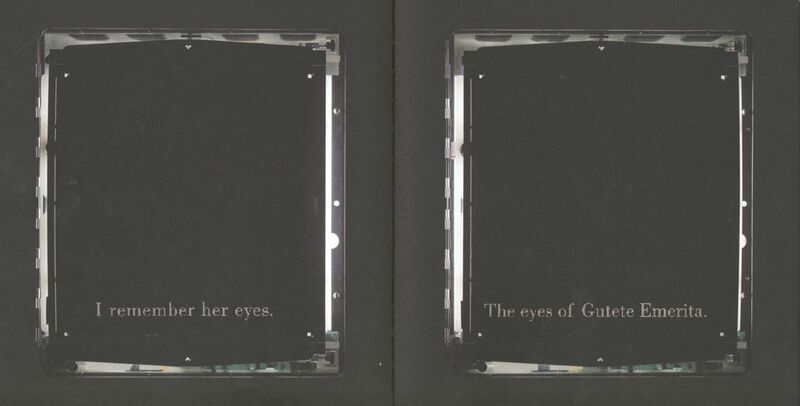 FHE EYES OF GUTETE EMERITA, 1996 Two quad vision light boxes with six B/W text transparencies and two color transparencies Time cycle: 45', 30', 15' and 1/5'. Quad vision light box: 26" x 23" x 6" Overall dimensions: 26" x 48" x 6". 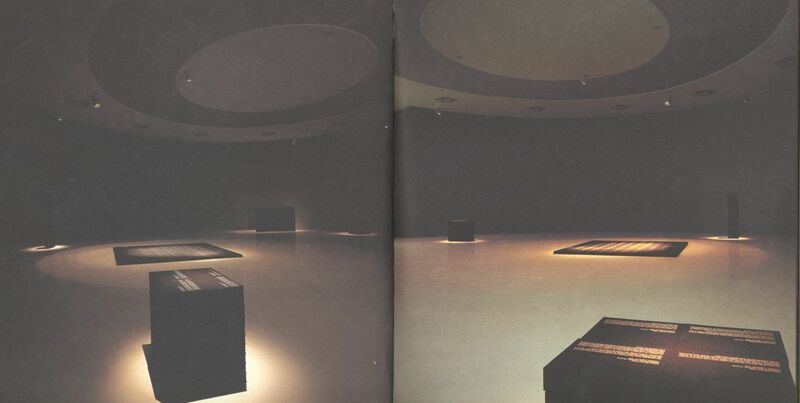 : The second image from Rwanda to appear in Jaar's constructions was The Eyes of Gutete Emerita, first shown at the City Gallery of Contemporary Art in Raleigh, North Carolina in June 1996. Two of the "quad vision" light-boxes were placed side by side, almost touching. 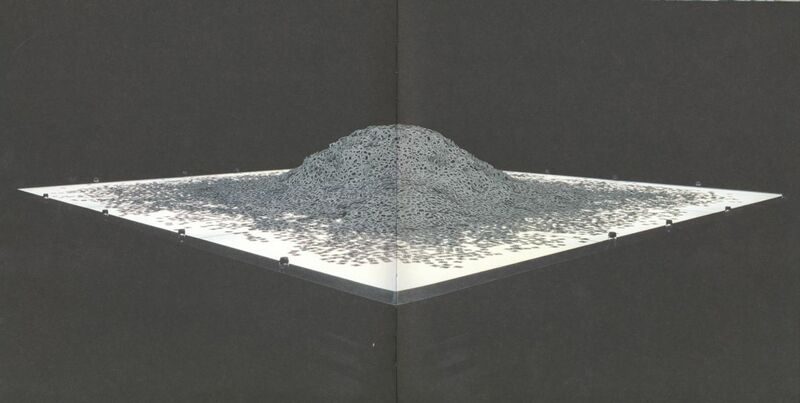 As in the composition with the two boys (and in the Slide + Sound Piece before it), the sequencing and timing of the changing words and images in this piece are what determines its effect. The method is cinematic even if the form is not. 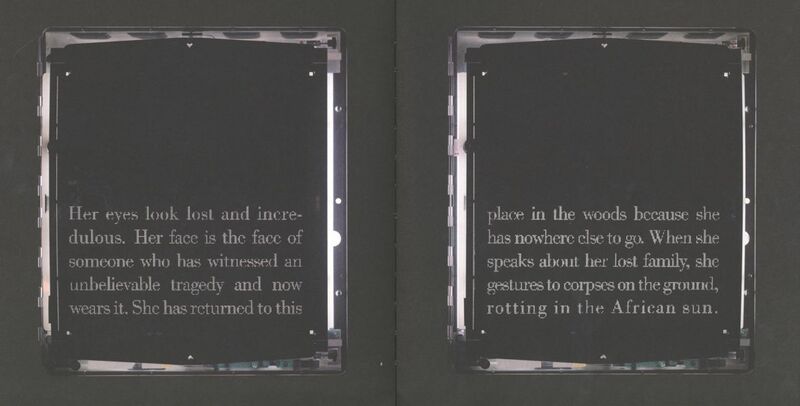 At the beginning of the sequence, a block of text appears, white on black, in each of the two lightboxes. These last two lines reverberate for 15 seconds. 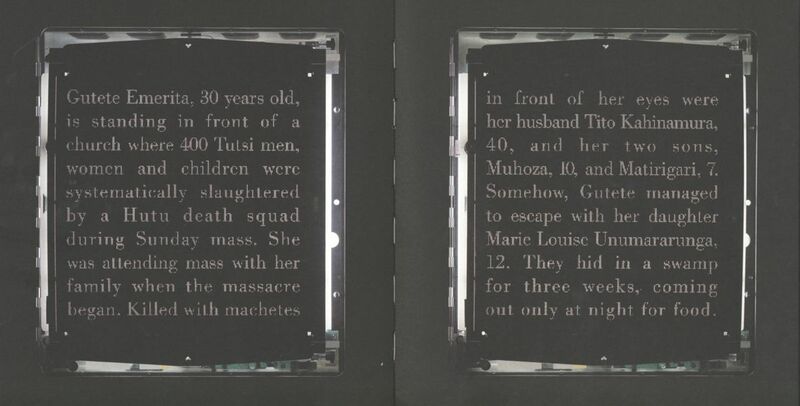 THE SILENCE OF NDUWAYEZU, 1997 Light table, slides, slide magnifiers, light box with B/W transparency Light table: 36" x 200" x 120". Light box: 6" x 258" x 4" Overall space dimensions: 15' x 40' x 28': At about the same time in 1996 The Eyes of Gutete Emerita took another form, this one more architectural than cinematic. It was first presented at the National Gallery of Australia in Canberra in February 1996. The first thing we see as we approach the work is a black wall with a thin line of text embedded in it at about eye level. It is the same text that appeared in the light-boxes: "Gutete Emerita, 30 years old, is standing in front of a church. . .'' We read the illuminated text as we move along the wall. "I remember her eyes. 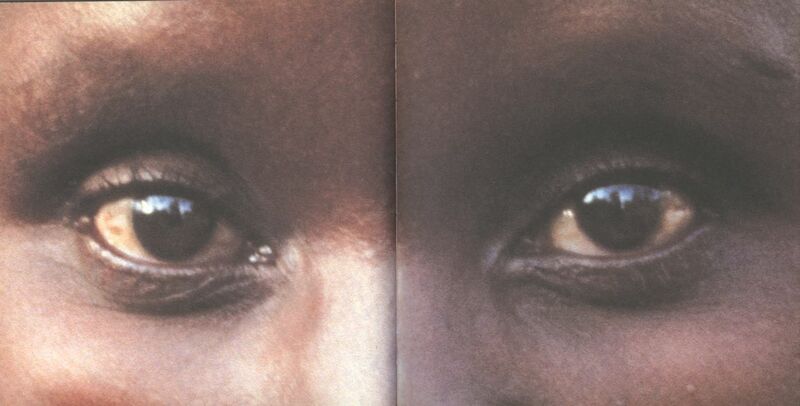 The eyes of Gutete Emerita." When we come to the end of the wall, we turn the corner and are confronted by a fantastic sight: a huge (16 x 16 foot) light table, on which is piled a mountain of 35mm slides. A million of them, in fact. A million slides for a million deaths. As we approach this apparition, we see that there are loupes arranged around the edges of the table. We pick one up, take a slide from the mountain, and hold it up to our eye. It is the eyes of Gutete Emerita. We pick up another slide—more Gutete eyes. Another and another, all eyes. The artist has said that it is this moment, when our eye comes that close to the eyes of Gutete, that is the moment he has been waiting for. 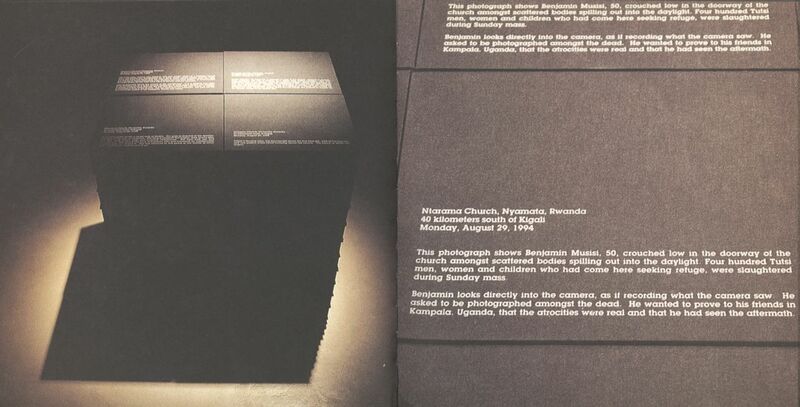 In that moment, the distance imposed by media representations of Rwanda is collapsed. 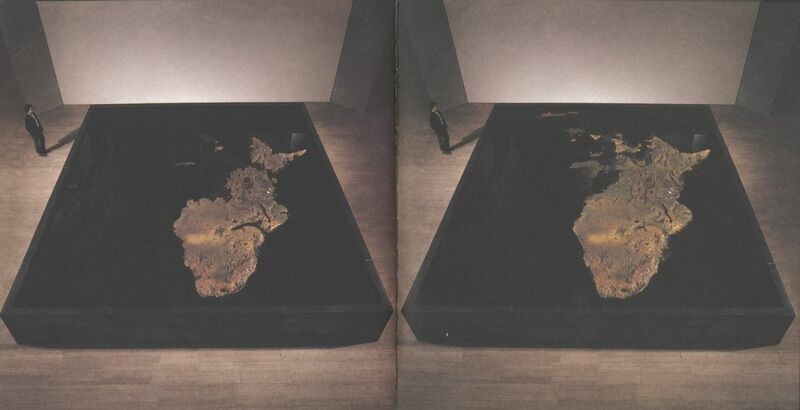 EMERGENCY,1998 Metal pool, water, fiberglass maquette, hydraulic system Pool: 36" x 24' x 22'6". Maquette: 12" x 21'6" x 19'8" Emergency frequence: 1 minute every 12 minutes: "We find ourselves at Centre d'Art Santa Monica, in Barcelona, in the central courtyard. An interior cloister surrounds a large courtyard where two large parallel arcs add to the volume, giving a distinct sensation of emptiness. (...) Just inside the limits of the interior square of the courtyard of Santa Monica Jaar has placed a large black square, the equivalent of measure and order, of the superior geometry created by the human mind, a universal form. 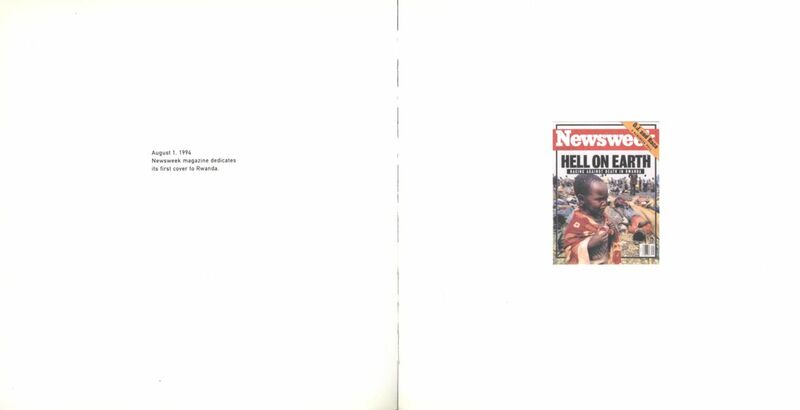 August 1, 1994 Newsweek magazine dedicates its first cover to Rwanda. "Hell on earth - racing against death in Rwanda"